But Can You Really Game on Them? So the short answer to this quesiton is not really. If you want to play casual games or older games, you'll be fine. Generally, you don't even have to run on the absolute worst settings. 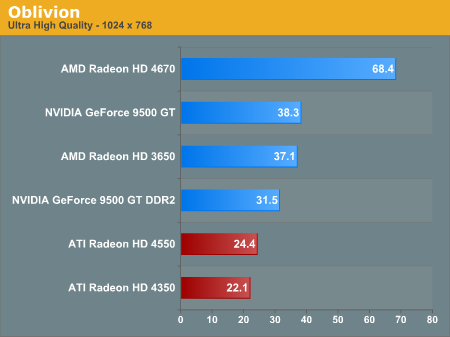 But you can't get near the quality even the 9500 GT is capable of delivering (let alone the 4670 which can deliver AA in some cases to low resolution gaming). 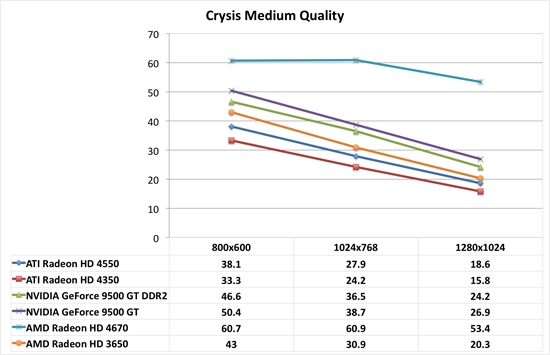 With our Crysis test, this time around we looked at everything set to medium quality. While the 4350 and 4550 performed alright at low quality settings, they really can't keep up when it comes to this step up. The 4670 really sticks it to all the other options here. 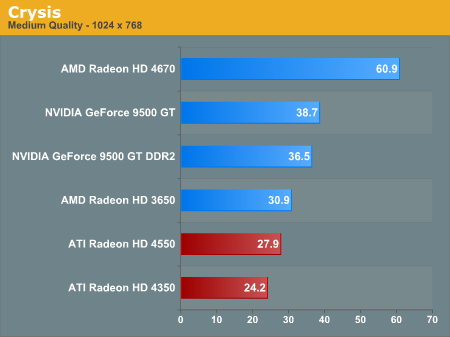 With the way the 4670 pegs the 60fps limit, we wanted to demonstrate just what the advantage can be. 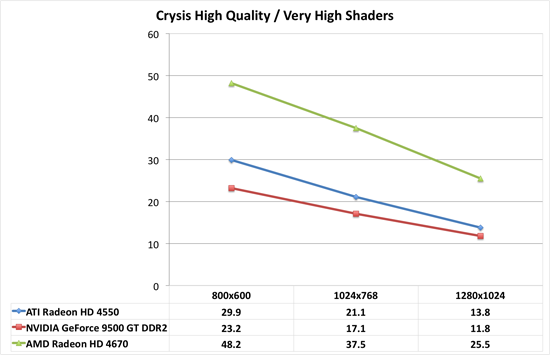 Running at our standard High Quality / Very High Shaders settings, it's clear that there is a fundamental difference in the type of performance you get from something like the 4670 and the 4550. Under Enemy Territory we were actually able to run at the highest quality settings with 4xAA and still get playable performance at 800x600. This isn't that bad, but keep in mind this game is based on an older OpenGL Doom 3 engine. Above 800x600 and we would really need to dial back the settings. Disabling AA goes a long way to boosting framerate, but at these low resolutions it is a shame to lose that feature. Finally, with Oblivion at our Ultra High defaults setting, we aren't really able to get above 800x600 and remain playable. We would really like to see north of 25fps for a playable experience in Oblivion, and we just can't pull that out at 10x7. 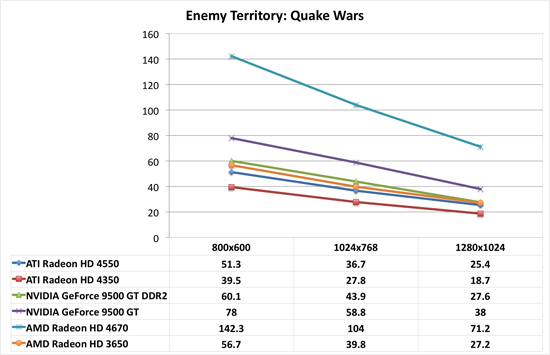 Again, even with the advantage the 9500 GT cards have, the gap there pales in comparison to the performance increase shown by when moving to the 4670. So while these really aren't gaming cards, they do reach up and touch the ability to enable high end settings at the lowest resolution in some cases. On modern games, higher powered options are needed for getting decent quality. 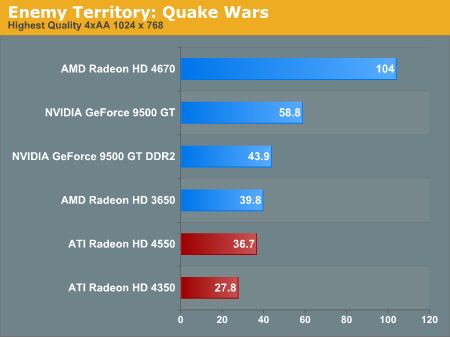 But either way, these cards are quite a bit faster than current integrated graphics solutions.